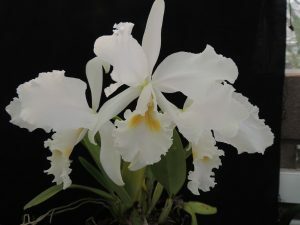 We have lots of South American cattleya species coming into flower in the greenhouse this week and on of the most dramatic is Cattleya warneri ‘alba’. This is a unifoliate cattleya (one leaved) and has very typical cattleya flowers which are large and frilly. The species is endemic to Brazil where it is found as an epiphyte in warm forest on the Atlantic coast. The plants have stout relatively short club shaped bulbs and these produce really big flowers. The flowers photographed are 20cm across. The leaves of this species can go a yellow colour if grown too bright in the summer and so we hang the species a little lower in the greenhouse (Warm Americas) than some of its relatives.